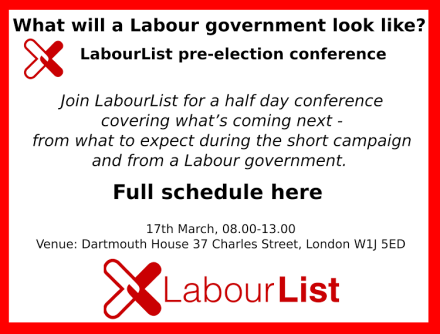 Join LabourList for a half day conference covering what to expect during the short campaign and from a Labour government. Sessions will cover Labour’s election campaign, Labour’s governing priorities and which ‘rising stars’ to watch out for in the Labour Party. Speakers include: Chuka Umunna (Shadow Business Secretary), Caroline Flint (Shadow Secretary of State for Energy and Climate Change) and Douglas Alexander (Shadow Foreign Secretary and Chair of Labour’s General Election Strategy). You can see the schedule in full below. Tickets are priced at £100, or £50 for attendees from the charitable/voluntary sector. You can buy tickets here. 11:00-­12:00 The next transport policies: What would transport look like under a Labour government? 12:00-­12:30 The next energy policies: What would energy policy look like under a Labour government? 12:30­-13:00 How would a Labour Government look?